One thing we consistently see with many of our graduates is their faithfulness to give back to Mercy and invest in our current residents. 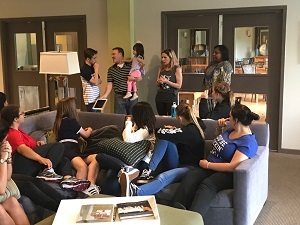 Recently, 1998 Mercy graduate and birth mom Bronwyn Williams paid a special visit to Mercy’s Nashville home. Accompanied by her husband Bill, their son Jake, and daughter Kenner, the family provided a catered lunch for our Nashville residents. 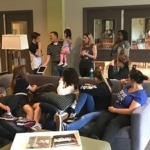 While in the home Bronwyn took time to bless and encourage each resident by sharing her own personal testimony and participating in a Q & A session. Residents had the opportunity to ask Bronwyn personal questions about her journey and life after Mercy. Bronwyn shared how Mercy helped her overcome obstacles in her life and now she is a successful business owner, wife, and mother. Bronwyn came to Mercy pregnant and was given the choice to parent or place her child for adoption. 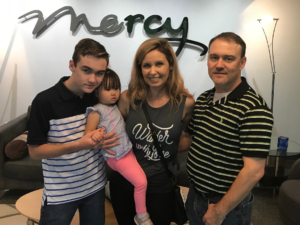 After choosing to place through Mercy’s Licensed Adoption Agency, Mercy worked with her to find a loving home for her child. While in the program Bronwyn became friends with Venice Gilmore who is a Mercy graduate and a current staff member (pictured). 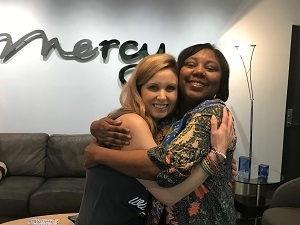 Bronwyn and Venice were happy to reconnect in the Mercy home they both graduated from. Venice was in Bronwyn’s wedding and they have remained very close over the years. Mercy is grateful for graduates like Bronwyn who continue to give back to Mercy many years after they have graduated from the program! Bronwyn with long-time Mercy staff member and friend, Venice Gilmore.